If you've been on Pinterest at all over the last few years (and who hasn't?! ), you know that pastel weddings have been all the rage. While I love a blush or mint wedding as much as the next gal, I also think it's a special treat when a wedding with a bright color palette comes along! Today's wedding is definitely one of those. These photos by Paxton Goates Photography are just gorgeous. If it's dreary in your neck of the woods, this wedding is sure to bring some cheer to your day! Carla + Mark were married at The Barn at Twin Oaks Ranch on June 20, 2014. Their colors were turquoise and fuchsia, and their style was "casual romantic," as Carla described it, with plenty of fun, Caribbean-inspired details. Their wedding was small and intimate; many of their details were related to their family members, and it's so obvious how much these two love their families! They included and honored their family in every aspect of their wedding, which sure makes a wedding day even more special! Before we talk about their wedding, I want to show you Carla's stunning bridals! This bride is SO pretty! Her beautiful dress, which was from The Bridal Cottage in North Little Rock, was perfect on her. Her accessories (and that RING!!!) were so pretty and classic too! Carla and Mark's first look was precious. These two really know how lucky they are to have each other! Carla said that moment was one of her favorites of the day, along with the moment she walked down the aisle and the special memories she made with her sisters. Carla's bright bouquet was gorgeous! This girl loves hot pink, so our floral designer, Ginger, created a simple, yet beautiful bouquet consisting of Carla's favorite flowers. As I mentioned, family is extremely important to this couple, so it only made sense for Carla to include a brooch that belonged to her grandmother in her bouquet. She also wore her grandparents' wedding rings - I adore this idea! The bridesmaids wore blue David's Bridal dresses and carried white bouquets, which were tied with fuchsia ribbon to match Carla's bouquet. Carla and Mark's ceremony decor was elegant, intimate and romantic, with a tulle altar, beautiful floral arrangements and a flower petal design down the aisle. Of course, their wedding party consisted of their beloved family members! Mark's attendants were his daughters, and Carla's sisters and niece were her bridesmaids. After their sweet ceremony, Carla and Mark and their guests headed over to The Barn for a delicious Caribbean dinner and a fun reception. Their tables were covered with white linens, printed pink runners, turquoise lanterns, small floral arrangements in white vases, and lit candles. Even their plates were Caribbean-themed... they were made from banana leaves! One of Carla's favorite details from the day was the memory table they had for family members who have passed away. Look at their adorable sweetheart table! The backdrop and chair signs are seriously fun! They had a tapas-style dinner with Caribbean jerk chicken tacos, pineapple rice and black beans. They also had the cutest signature drinks - mini pink strawberry margaritas with blue sugar rims. We are crazy for these!!! As with every other detail from their wedding day, Carla and Mark's cake, made by theCakePlace, was fabulous! This cake is AMAZING... It's unique and the bling is perfect! Carla and Mark also had another cake at their reception... a cake for Carla's sister, whose birthday just happened to be on their wedding day! I told y'all... these two LOVE their family! After their ceremony, Carla and Mark went on their honeymoon to Destin, Florida. Carla said they "laid on the beach, went parasailing, and had a wonderful, relaxing time." Everything a honeymoon should include! 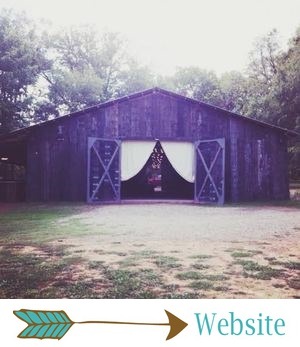 I asked Carla to let us know about her experience with The Barn, and her answer was short and sweet: "I can't pick one favorite detail," she said. "Everything was just amazing. The Barn is wonderful to work with... Y'all did fantastic! I loved everything." Tomorrow's post is all about our three wedding collections. If you're curious about what we offer, you will NOT want to miss tomorrow's post!